Announcing the Winners of the New Year’s Challenge! 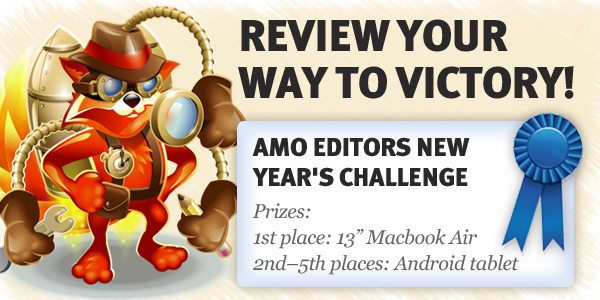 The AMO Editors New Year’s Challenge ran from December 22nd to February 22nd. We have tallied up the results, and here are the winners! Our top prize goes to Nils Maier! Nils is the author of the very popular DownThemAll! extension, as well as other add-ons such as Scriptish and MinimizeToTray revived. He is very valuable community member who has helped us raise the bar in add-on security, and is currently very active helping the MemShrink team with add-on memory leak reports and documentation. We decided to give away one extra prize because the runner-up race was pretty intense and everyone on this group deserved special recognition. Leszek Życzkowski, author of QuickNote, Copy Plain Text 2, and many others. Andreas Wagner, author of Slim Add-ons Manager and WebReview. Diego Casorran, author of FB Phishing Protector, Personas Shuffler, and many others. Ken Barbalace, author of the Classic Compact theme and its companion extension, Classic Compact Options. Thanks to the excellent efforts of the review team, this contest was another resounding success. The volunteer reviewers completed a total of 3500 reviews during these 2 months, and for the first time ever we completely cleared the review queues. You guys are awesome! Thanks to the reviewers’ hard work! It’s a tremendous effort to review that much code! I don’t understand the prize structure. Why are you supporting a company that will not even allow Firefox installation on their mobile OS? Mozilla is so very puritanical on a lot of other political issues yet apple is ok? Apple hardware is very popular among the tech community. It’s certainly very popular within Mozilla, where the majority of laptops you’ll see are MacBooks (mine is as well). We don’t support some of Apple’s policy choices, just as much as we don’t support some of Microsoft’s and some of Google’s. I don’t see why that would block us from being practical and supporting Firefox in their systems as much as possible, or using their systems because we think they’re the best tools to get the job done, or picking products or theirs as prizes that are appealing to contest participants. Having said that, I don’t think we would ever consider giving away iPhones or iPads given their very restricted nature. This is not the case for Apple laptops or desktops (yet?). For the price of a macbook air you could offer developers a Samsung Galaxy S II for them to test B2G on, along with the choice of a variety of different Android tablets with which they can test Fennec. We gave away smartphones for the runners-up last year, so we decided to go with tablets this time around (since the participants were almost the same people). The first prize was a laptop in both contests. Many, many kudos to Nils Maier for all the effort he’s put into making, well, *everything* more awesome. I think the competition has paid off for both sides.